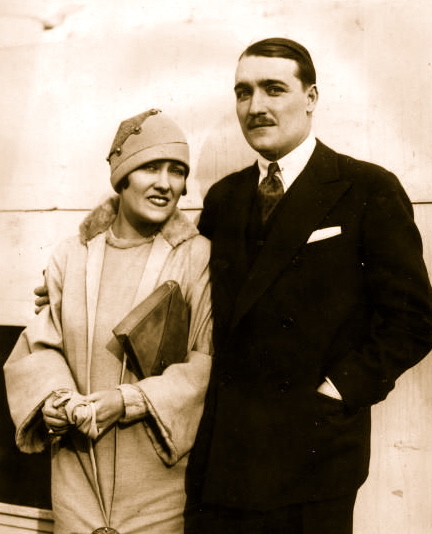 1925: American actress Gloria Swanson (1899 – 1983) and her husband, Marquis Henri de la Falaise on board the SS Paris. A’Lelia Walker was also aboard sailing in First Class along with Miss Swanson. Miss Walker would have selected the French Line because France was viewed by many African Americans as a welcome change from the widespread backward racism in the United States. Plus the USA was stuck with prohibition and you couldn’t get a drink on an American ship. So anyone looking for some fun… to avoid being stuck with a dreary dry county church social atmosphere… selected foreign flag ships. During this time that jazz was introduced to the French and black culture was born in Paris. Miss Walker had a big influence on the Harlem Renaissance. As a wealthy philanthropist, she enjoyed throwing lavish parties that brought writers, artists, and publishers together. 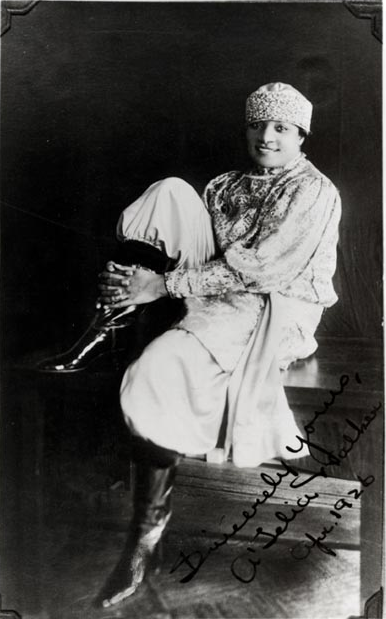 During the Harlem Renaissance, Walker organized literary events in her New York townhouse nicknamed “The Dark Tower.” She also organized parties at her country mansion along the Hudson River, known as Villa Lewaro. Prominent writers, artists, and African and European royalty attended these events. In 1922, she went to Africa to visit Ethiopian Empress Waizeru Zauditu. Fond of expensive cars and precious jewels, she also symbolized the extravagance of the “roaring” 1920s. Poet Langston Hughes dubbed A’Lelia the “joy goddess of Harlem’s 1920s.” When she died in 1931, Hughes wrote that her passing marked the end of the Harlem Renaissance. For more information on the fabulous A’Lelia Walker please click here. A great video of the SS Paris. 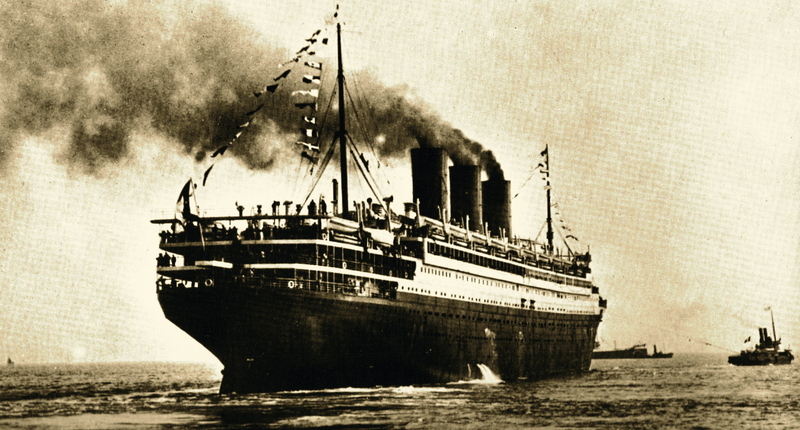 The SS Paris leaving New York. The SS Paris was a French ocean liner built in Saint-Nazaire, France for the Compagnie Générale Transatlantique. The French Line’s Paris was built by Chantiers de l’Atlantique of St. Nazaire. Although the Paris was laid down in 1913, her launching was delayed until 1916 and she was not completed until 1921, due to World War I. When the Paris finally completed, she was the largest liner under the French flag, at 34,569 tons. 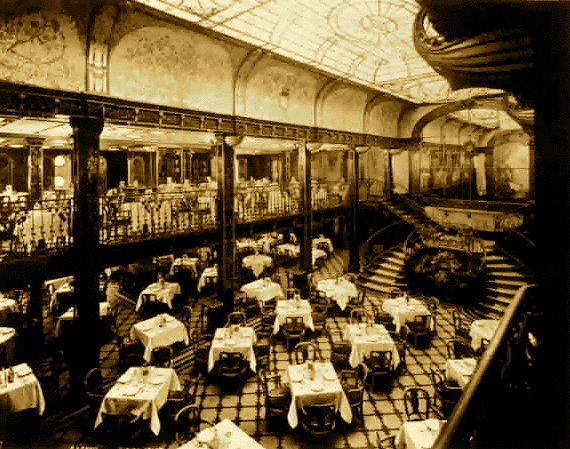 The grand stairway/entrance and the dining salon of the SS Paris. The Paris’s interior reflected the transitional period of the early twenties, between the earlier preferred Jacobean, Tudor, Baroque, and Palladian themes in favor of the sleekness and simplicity of her Art Deco arrangements. The Paris had something of a magic touch, with every possible kind of interior. 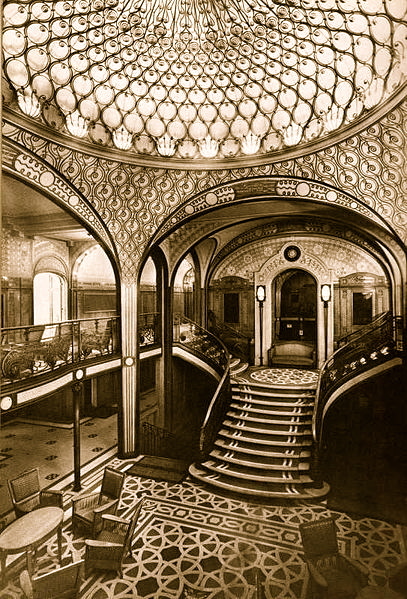 Passengers could choose to travel in the standard conservative palace-like cabins, but the ship also featured Art Nouveau and hints of the Art Deco that the Ile de France would boast six years later. 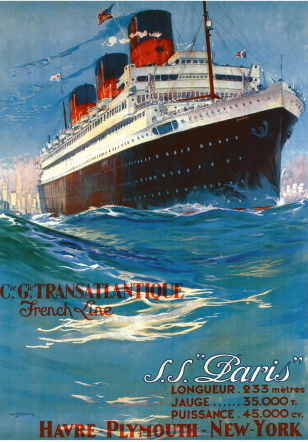 Poster advertising the SS Paris services from New York to Europe. The luxury of the Paris was something no other liner could claim to have. For starters, most first class staterooms had square windows rather than the usual round portholes. In a first-class cabin you were able to have a private telephone, which was extremely rare on board a ship. A valet on the Paris could be easy to summon in his adjacent room, rather than in a cabin in the second class, uncomfortably far away. 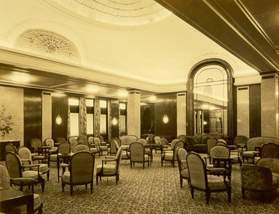 Dining on the Paris was excellent, her service was superb, and the living spaces were divinely comfortable and luxurious. French Line ships had enormous appeal in the twenties-“Floating bits of France itself”, as one brochure aptly stated. Service and accommodation were fine but the cuisine was its most outstanding feature, it is said that more sea gulls followed the Paris more than any other ship in hopes of grabbing scraps of the haute cuisine that were dumped overboard. The French Line’s success took off when a third ship joined the relay: the Ile de France. With the onset of the Great Depression, even these stylish French beauties were sailing only a third full. The French Line avoided the possibility of “laying-up” by pressing the ship into cruise work. To some, it seemed scandalous to have such ships lazily roaming the Mediterranean or Scandinavia with a mere 300 passengers on board. On 18 April 1939 the Paris caught fire while docked in Le Havre and temporarily blocked the new superliner Normandie from exiting dry dock. She capsized and sank in her berth where she remained until after World War II, almost a decade later. 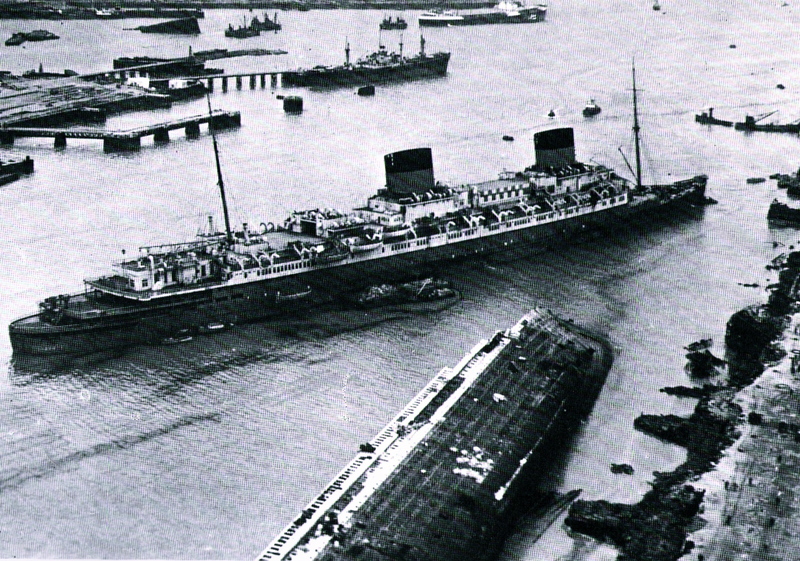 The SS Liberte steams past the capsized SS Paris. A year after the war had ended, the 50,000-ton German liner Europa was handed over to the French Line as compensation for the Normandie and renamed Liberté. While the Liberté was being refitted in Le Havre, a December gale tore the ship from her moorings and threw her into the half-submerged wreck of the Paris. She settled quickly, but fortunately in an upright position. Six months later she was re-floated and by spring 1947 she was in St. Nazaire for her final rebuilding.